A high-sensitivity Level 3 penetrant, ZL-67 fluorescent water removeable penetrant is designed to find smaller, finer indications in safety-critical components common to aerospace and engineering applications. ZL-67 penetrant is often used to find flaws in investment castings, jet engine components, and highly machined surfaces. 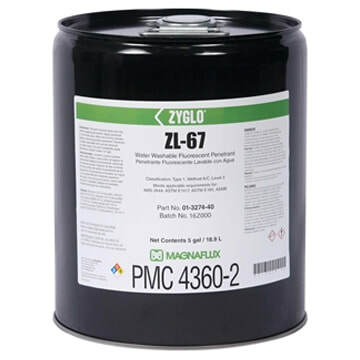 ZL-67 is specially formulated for strong capillary action which allows it to penetrate defects quickly and bleed out into developer faster and more completely than other penetrants for stronger, higher contrast indications that are easier for inspectors to identify, even when the defects are very fine. ZL-67 is listed on the QPL SAE AMS 2644 Qualified Product List and is approved for use by Pratt & Whitney. Recommended developers are ZP-4B dry powder, SKD-S2 or ZP-9F solvent-based, and ZP-5B suspendible developers.